Jules Bastien-Lepage (French, 1848–1884), Le Père Jacques (Woodgatherer), 1881. Oil on canvas. Miwlaukee Art Museum, Layton Art Collection, Gift of Mrs. E. P. Allis and her daughters in memory of Edward Phelps Allis L102. Photo credit: John R. Glembin. One of the things that I enjoy about being a curator is that I am always learning something. Here is one example. In the middle of August, the Cornish American Heritage Society held their “Gathering of the Cornish Cousins” in Milwaukee. The event offered talks and workshops on all things Cornish, and one of the organizers had asked me to do a presentation on the artists of the Newlyn School. I knew a little about Cornwall from visits to the southwestern part of Wisconsin, plus I loved pasties, but I knew nothing about art in Cornwall. A quick search told me that they were a group of artists that, in the 1880s, formed an art colony in a Cornish fishing village called Newlyn. So, I said, sure, why not? And now, after a year of reading about the Newlyn artists and looking closely at the artwork produced by them, I’m so glad that I did! The late 19th century was a time of immense change in all parts of life, and artists such as those of the Newlyn School were not immune to this. They, like everyone else, had to respond to the social and environmental changes brought on by the industrial revolution. One of the key questions was, what did it mean to be modern? Part of the answer, for the Newlyn artists, was influence by the French artist Jules Bastien-Lepage. 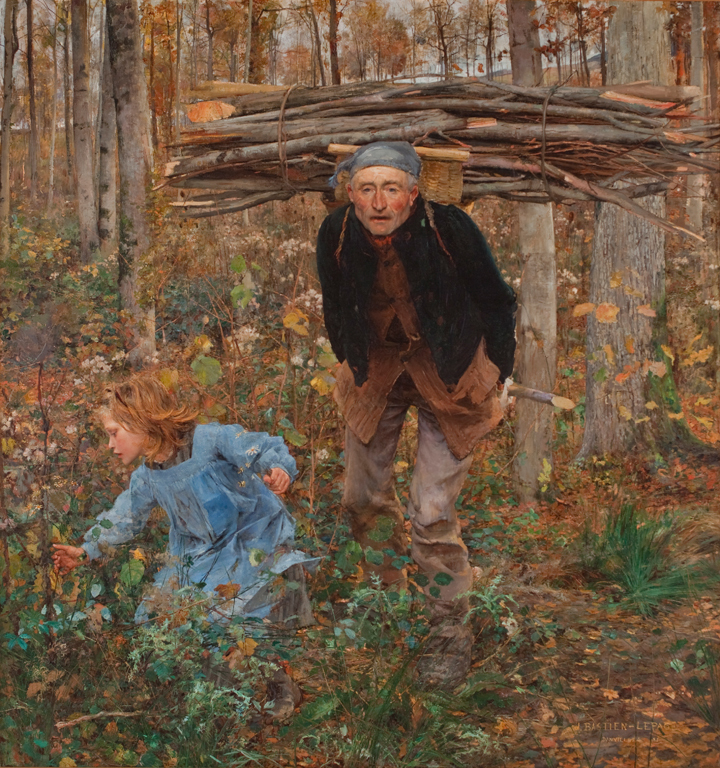 And Bastien-Lepage just happens to be an artist represented in the Layton Art Collection with his 1881 painting, Le Père Jacques (Woodgatherer). A number of Bastien-Lepage’s paintings, after they were shown at the official Salon in Paris, were put on display in London; among them include Les Foins (Hay Gatherers), Joan of Arc, and Le Père Jacques (Woodgatherer). They were very controversial. Both French and English critics of the established art world were troubled that the extremely detailed backgrounds made with broken brushstrokes contrasted with the smoothly painted and finely modeled figures. In particular, Les Foins was disturbing in the realistic—and not very beautiful—face of the girl, the awkward poses of both figures, and the overall feeling of fatigue in the scene. It was not the idealized, uplifting view of life or the moralizing narratives that the mainstream were used to seeing. Jules Bastien-Lepage (French, 1848–1884), Le Père Jacques (Woodgatherer) (detail), 1881. Oil on canvas. Miwlaukee Art Museum, Layton Art Collection, Gift of Mrs. E. P. Allis and her daughters in memory of Edward Phelps Allis L102. Photo credit: John R. Glembin. Furthermore, Bastien-Lepage was dedicated to painting en plein air, which is a French term meaning “in the open air.” Essentially, this meant that he painted out-of-doors, directly onto the final canvas. Up until the 19th century, artists would make drawings and small oil sketches outside and then bring them back to the studio to make a finish painting. In the quest to show nature in all its glory, artists, most notably those associated with the Barbizon School, began painting outside, on-site. 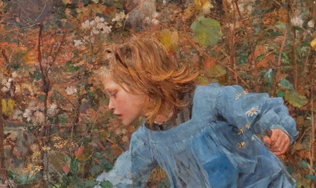 For young artists in England, the avant-garde French painter Jules Bastien-Lepage offered a new—and modern—vision. They flocked to Paris to study in the studios of established artists, and then during the summer they traveled to the county to escape the hot city and find interesting subject matter, which they painted en plein air. Here’s where it all comes together: Many of the artists that worked at Newlyn at some point between the 1880s and 1890s were among those who were influenced by Bastien-Lepage and studied on the continent. The best example would be the Irishman Stanhope Forbes. He began his schooling in London, and then after studying in France, he returned to England to find a good location to paint figures in a picturesque setting. He spent his almost 70-year career in Newlyn, and early on became known as the father of the Newlyn School. Forbes’s 1885 submission for the Royal Academy exhibition was his first major painting created in Newlyn, and it is considered to be his masterpiece. Fish Sale on a Cornish Beach shows the influence of Bastien-Lepage and other European artists in his painting style, coloring, and use of ordinary people as models. Forbes was also committed to painting en plein air, and the work was completely painted on site over many months. Plein air painting was one of the first shared interests of the artists who worked at Newlyn. They also explored how to show natural light indoors and focused on a rural subject matter that was distanced from the industrialization of England. Although Fish Sale on a Cornish Beach was admired by English critics and the public, it was rejected for purchase for the National Collection at the Tate, because, according the contemporary periodical The Magazine of Art, the painting was “too positively the outcome of a foreign school.” It was just too French for the English! It’s so great to get a new perspective on favorites in the Milwaukee Art Museum Collection. Maybe someday we’ll see Newlyn artists hanging side by side with paintings by Bastien-Lepage. This entry was posted in Art and tagged art history, modern, painting, plein air. Bookmark the permalink. La Pere Jacques (Woodgatherer) has always been one of my favorite paintings from MAM since I first started going to MAM when I was at UWM. I never knew that he was considered avant garde for his time and that he loved to paint plein air, and that he also influenced so many young artists! Thank you for this information and a different take on what so many consider a “traditional” painting!